Attention QuickBooks Online customers: Print AP checks from multiple QuickBooks Online companies to the same, blank check stock. Our cloud based PrintBoss Online is perfect for those that need the flexibility of printing checks anywhere, anytime and on any device. 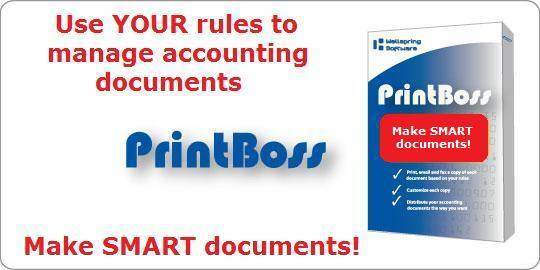 Click here to try PrintBoss Online today for free! Save Money. Don't pay for expensive pre-printed forms. Save Time. Your time is valuable. PrintBoss can make it more available. Add security by using blank stock. Make your software more secure with PrintBoss. Simultaneously print multiple copies from different trays and/or printers. Export your document to a TIFF image file. Export your document to a PDF file. Email original documents or copies.